Hamilton Local School District provides services to students ages 3 through 22 identified as disabled under Individuals with Disabilities Education Improvement Act of 2004 (IDEA). 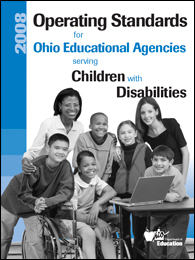 Special education services are provided in accordance with Ohio's Model Policies and Procedures for the Education of Children with Disabilities. Approximately 12% of the Hamilton Local student population has been identified with a disability. The special education students' needs are typically served in the regular education classroom with additional support provided by an intervention specialist. Special education services are provided according to each child's individual needs and in the least restrictive environment. View our complete Speech Intervention Resource page. The Hamilton Local School District is committed to the identification, location, and evaluation, as required by IDEA and federal regulations, for all children between the ages of 3 and 22. 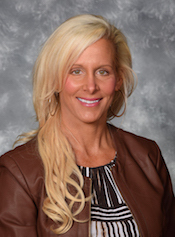 If you have knowledge of or suspect a child has a disability please contact Jamie Angelini, Director of Special Education, at 614-491-8044 ext. 1233, with concerns and/or names for Child Find referral within the Hamilton Local School District. 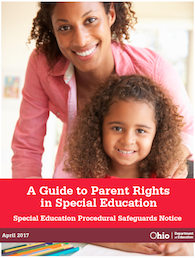 Official site of State Support Team - Region 11 that includes many special education resources for parents. 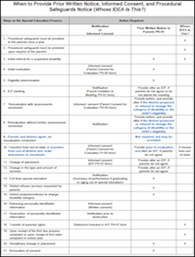 Special Education Procedural Safeguards Notice from Ohio Department of Education (Updated April 2017). Information for parents who have children with bipolar disorder.